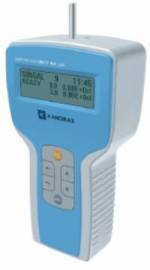 The 3887 hand held particle counter from Kanomax USA measures and displays three particle sizes: 0.3, 0.5, 5.0 mm. The unit features a built-in flow sensor that insures highly accurate measurement and the on-board memory stores up to 10,000 sampling records. Real-time data transfer to your PC is available with the standard RS232C interface and Window 7 compatible software. The Kanomax 3887 aerosol particle counter is light-weight and portable at only 1.5 lbs. The unit is powered by AA batteries or 110-240 AC current. The handy optional carry case neatly stores and protects the meter and all of the optional equipment. The 3887 comes complete with isokinetic probe, zero filter, meter stand, data processing software, RS232C cable, 6 pc. AA batteries, battery charger, AC adapter, and calibration certificate. The 3887 is the perfect tool for clean-room or clean-bench monitoring and verification, IAQ investigation, food processing, hospital surgical rooms, and filter testing. NEW!! 3-year Service Packages are now available for calibration and repair services with purchase of new 3887s. Available in Gold and Silver levels, both service packages offer substantial savings and are the perfect way to keep your 3887 functioning in top condition.